The split screen cinematic technique has been popularized by the famous movie director Brian De Palma who used it in some of the best films created in the second half of the 20th century. Split screen can be used to show two or more actors at the same time, create suspense or most famously to depict a telephone conversation. The technique is frequently used by professional filmmakers, but video enthusiasts can utilize it equally adequately in their videos. In this article, we will show you how you can create the split screen effect in Movavi video editor. In order to start creating the split screen effect, you must first make sure that you have two or more video clips that correspond to each other because using shots that don't have anything in common will only confuse the viewer. Each video editing process starts with this simple step since the files must be in the video editor before you can start editing them. 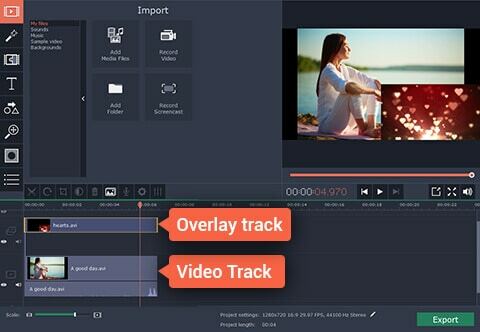 After you start Movavi video editor, select the 'Create a project in full feature mode' option and then click on the 'Add Media Files' button in the video editor's main window. The files you selected will automatically appear in the 'Video Track' on the timeline. Drag one of the video clips you imported to the 'Overlay Track' and double-click on it to access the editing mode. The next step will require you to click on the drop-down menu located above the preview window and select the 'Side by Side' feature. You will see four different buttons next to the drop-down menu that will enable you to choose on which side of the screen the video clip located on Movavi's 'Video Track' will be displayed. Simply hit 'Apply' once you positioned your videos in a way which suits you. Using a few different video clips in the same frame will create a bit of a mess on the audio track and for that reason, you must mute the sound files before saving your project. In order to do so, just click on the 'Mute' icon on the Video or Overlay Track. Now that your split screen video is complete, click on the Export button and select the format of the video you would like to use. Then just click 'Start' and wait for the video to be exported. How to Make a Split Screen Video with Movavi Alternative? Even though creating split screen videos in Movavi is easy, an alternative video editing software may provide you with more possibilities. 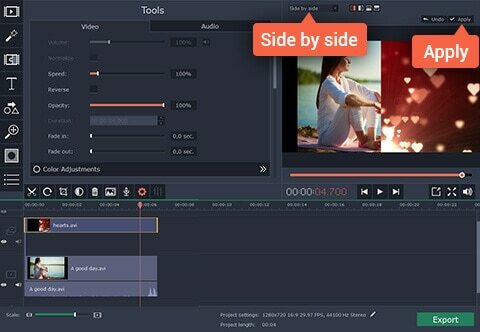 Wondershare's Filmora is an excellent choice for all video enthusiasts who are looking for a powerful video editor that provides an easy way to create split screen videos. At the beginning of the editing process, click on the 'Split Screen' feature in the main menu. This action will enable you to access the 'Layout Library', select one out of many different layouts offered by Filmora and drag the layout you selected onto the timeline. Afterwards, click on the 'Import Your Media Files Here' button to import the video clips you want to use and drag and drop them to the 'Drop Zone'. After you have positioned your videos correctly, adjust the duration of the split screen effect by dragging its end, left or right depending on how long you want the effect to last. Once you've fine-tuned all the settings, click on the 'Export' button and share your videos with the online community.